1. Preheat over to 350. Grease a 12 cup muffin pan and fill each cup halfway with bread cubes. Top each with a slice of cream cheese. 2. In a small saucepan heat the EVOO over med. heat and add the ham, scallion whites, and a pinch of pepper. 3. Cook, stirring, until scallions are tender, about 5 minutes. Stir in the half and half and bring just to a simmer before removing from heat. 4. In a medium bowl, whisk together the eggs and thyme. Then whisk in the warm half and half mixture. 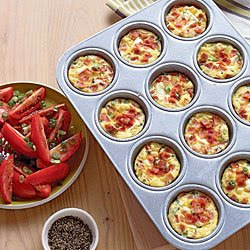 Fill muffin cups with egg mixture and bake until puffed and golden around edges, about 15 minutes. 5. Let cool for 5 minutes, then run a knife around the edges and invert onto a a cooling rack. 6. Drizzle the tomato slices with EVOO, top with the scallion greens, and season with salt and pepper. Serve with the mini casseroles.